We are continuing to work on our summer projects. Here is the draft of our camp curriculum. http://goo.gl/oxwnP. We only have a week and half before we start and there is still a lot to do. We have had a lot of requests to help\start FLL teams next year and a few VEX teams as well. 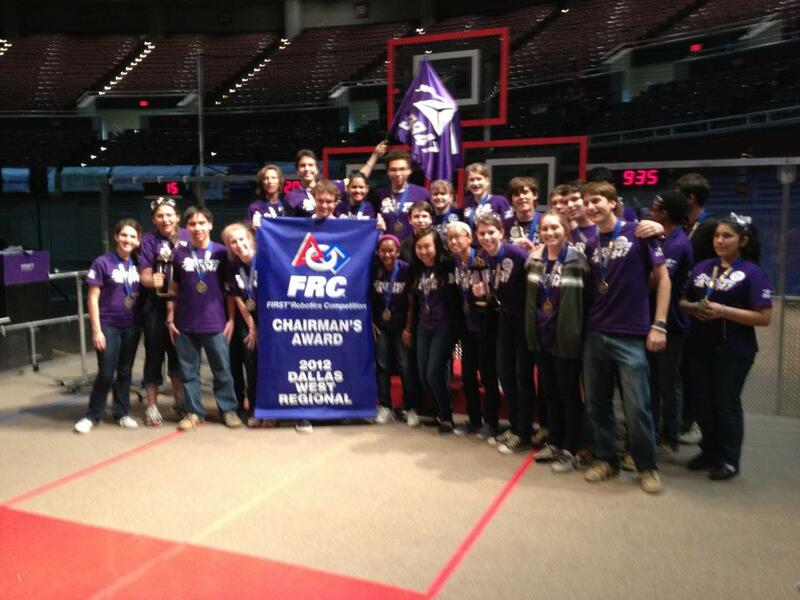 We're very excited to be mentoring teams not just in FRC next year. Hopefully we will be able to take Ultraviolet (our robot) on a lot of demonstrations this summer. This week is also our end of year celebrations; we had a party last night and paintball tomorrow. Lots of team bonding. Our meeting yesterday ended up generating this list of summer tasks. Some of it won't get done, but hopefully we will be able to knockoff a great deal of it. Show them an old Kickoff Video and talk to them about sample rules and how to brainstorm strategies and robot design. We stopped updating at the end of build season but we want to get back in the habit of having an easy public source of updates about our team. People may be interested in our off season work as well. These won't be every night, but we're planning on weekly updates. First let's catch everyone up on our season. Competition season was amazing for Spectrum, we spent the 5 weeks leading up to Dallas-West working on the practice robot, and preparing for our 1st competition as Spectrum. The robot work mostly revolved around working on the software and getting used to the robot. We did several things to improve collection but we were never really able to get our shooter consistent since we didn't have an easily accessible practice field. We were able to drive the practice bot at 118's facility on the Saturday before Dallas-West. That was a fantastic experience and we learned several things that we needed to fix on the robot. We also planned the installation of a magic jack on the robot to assist with the triple balance. The competition planning took up a huge amount of our time; because we had to acquire all the things we needed for a quality pit and put together all of our spirit and logistics items. Also we were planning and rehearsing our Chairman's presentation. Dallas-West was a really great regional, it was awesome to have nearly 80 teams in one venue but still get to play 11 matches. Our robot performed very well and we ended up seeded 8th at the end of qualification and then the 6th seeded alliance captain. We partnered with 456 and 3735 both fantastic alliance partners. We lost to the eventual regional finalist but we played two great matches. Awards ceremony was all that was left and we had entered our Chairman's entry here, going in we didn't think we had much of a shot but the judges saw things differently. We won the 2012 Dallas-West Chairman's Award as a sophomore team. Very few sophomore teams have ever won this award, by our count only 12. It took a tremendous amount of work by every member of the team to be able to transform and build this team so quickly but it was completely worth it. We had many more problems at Lone Star than we did at Dallas-West. Thursday was very relaxed but Friday was very stressful because we had to replace our cRIO twice before we were running at the level we were during Dallas-West. This meant that many of the changes were planning to implement never happened as time was spent on fixing cRIO issues. We worked very well Saturday but we fell through the cracks and weren't picked during alliance selection. We earned a spot at the Championship event because of our Chairman's win. The competition was extremely competitive and due to a very bad match schedule (playing 4 of the top 5 teams in our 9 matches). We were only able to walk away with a 4 and 5 record, no small task with a schedule like ours. However one of those wins was against the 2011 World Champions 254: The Cheesy Poofs. Video of that match is below. We executed our defensive strategy perfectly and were able to prevent them from easily out shooting us. Overall we played very well at Championship and made a great impression for a second year team. Hopefully we will be back in the near future. Our next update will talk about the area's we plan to improve as a team and our off-season plans. Next Competition: July 28th Texas Robot Roundup - Anderson High School, Austin, Texas.